Rosey Palms is our group name. Bahaha. 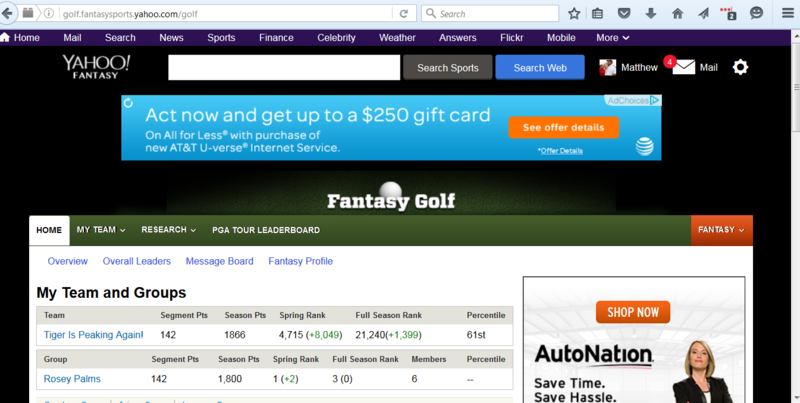 That is the Fantasy Golf home page. No wonder the only valuable asset Yahoo! has is a Chinese search engine. 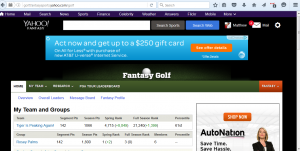 Fantasy golf is the bottom feeder of fantasy sports. If you go to Yahoo’s fantasy sports page it’s listed below hockey and above NASCAR. Just barely more popular than fantasy NASCAR seems about right for fantasy golf. There are no trades, no draft, no keeper leagues, no smack talk, no live team-score updates. The season starts right as fantasy football is finishing but even the most degenerate gamblers in your football league will draw the line at fantasy golf. Fantasy golf is so uncool that you might think that’s what makes it cool. It isn’t. There isn’t anything cool about fantasy golf. Having said that, I played fantasy golf the last five years. I won the season championship once which is actually slightly better than average from a league of six players. Wait!! Don’t click away to something else. I know that look. I know there is nothing more uninteresting than listening to someone talk about their fantasy team. One time in the coffee break room at work, I started describing to someone about how a second string running back piled up 40 points against my team to knock me out of the playoffs…wait!! You have that look again. I understand it. I’ve been subjected to it. I lose eye contact, I back away and I say something designed to discourage them like, “I hear ya” or “wow”, while staring at my coffee. They’ve lost me as soon as they started. It’s like listening to someone talk about their commute but way worse. 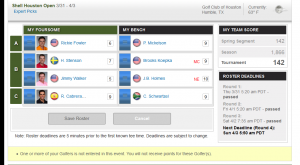 The rules for Yahoo fantasy golf are pretty easy but it does require some explanation. I can totally understand if you don’t want to get “in the weeds” here. If you don’t care then skip to the next paragraph. You’re still reading? Okay! The Yahoo league allows you to pick 8 players to make up your “team”. You have 2 payers from an A group, 4 players from a B group and 2 players from a C group. The A, B and C groups have no relation to ranking or ability and seem to have been chosen at random. You choose 1 player from the A and C groups to start and 2 players from the B group to start. The players you started get points based on how they do against the low scorer of the day. You can switch players off your bench for the next day’s play or if you any of your players miss the cut. 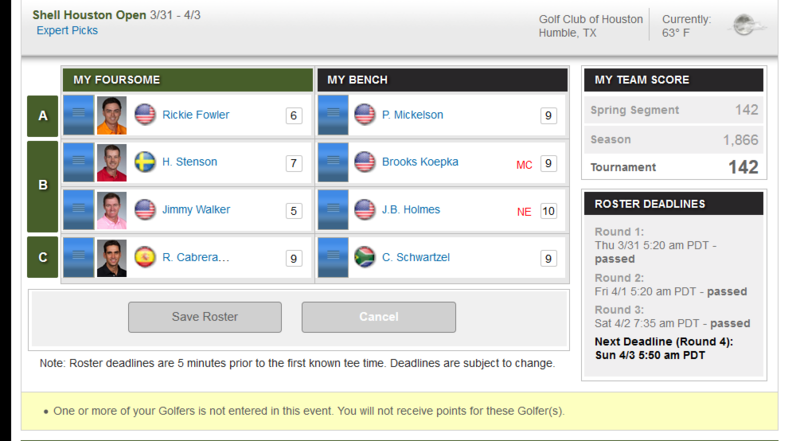 Here is my team for the Shell Houston Open. JB Holmes has an NE by his name, not entered. He withdrew with a shoulder injury after I made my picks. Whatever. You need to pick the players on Wednesday night before the tournaments start on Thursday; the deadline is usually around 5 AM on the West Coast. I have literally bolted upright from a dead sleep on Wednesday night, realizing I hadn’t made my picks (pathetic, right?). You get a bonus if any of your players make the top three. There are weekly payouts and a season payout in our league. One season, to spice things up, we actually held a draft for the Players Championship. It was poorly attended with several guys auto picking and we never did it again. What do I like about fantasy golf? Well, there’s no draft, there are no trades, there’s no keeper league and there’s no smack talk. All that stuff that can become annoying about fantasy football doesn’t exist in fantasy golf. You don’t spend a lot of time interacting with your competitors. You don’t spend a lot of time researching. The key to a strong finish: you must remember to select your team by Wednesday night and make sure you sub out your chumps that missed the cut Friday night. You do that and you’re guaranteed third place! Why is that? Because most weeks somebody forgets to make his picks or forgets to sub out the guys that missed the cut. Again, no one really gets that up for setting the lineup so it’s easy to forget. The other strategy I use is that I sub out players that score really well. The theory is that sustained birdies are tough to sustain. Another strategy is to look at the starting times and try to start players who play in the morning. That’s because winds pick up in the afternoon and it’s harder to play golf in the wind. I don’t get into it enough to make the effort it takes to check starting times. Tiger Lets Out Some Shaft! Tiger Finds the Short Stuff! Tiger Wants to Hit it Again! Those are double entendres. Wacky! This is a really bad endorsement for fantasy golf, I know. Is fantasy golf for you? If you don’t like people but you like to bet with them, then you might enjoy it. Can you remember things like deadlines? Then you’ll probably be good, at least you’ll finish third. Okay, to send you away feeling positive about fantasy golf, I made up a tagline: Fantasy Golf, Because there is no Fantasy Tennis.